There’s been a lot of talk in the U.S. in the past year or two about the prospect of raising the requirements for average fuel economy. Current plans call for raising that average from 27.5 to 35.7 mpg by 2015, which has caused considerable alarm in some quarters. To make sense of all this, let’s talk about how the corporate average fuel economy rules work, where they came from, and what they’re designed to do. Also, your author weighs in on the merits of these regulations. Author’s Note: This article was written in 2009 and is now out of date — it has not yet been updated to reflect subsequent regulatory changes. Reader beware! The current U.S. rules on corporate average fuel economy are a direct result of the 1973 oil crisis. In October 1973, during the Yom Kippur War, the Organization of Arab Petroleum Exporting Countries (many of the member states of OPEC, plus Syria and Egypt), declared an embargo on oil shipments to the U.S. and its allies to protest their military support of Israel. The embargo lasted until March 17, 1974, quadrupling the price of oil and leading to widespread shortages. In the U.S. (and some parts of Europe) there was a brief return to fuel rationing for the first time since 1945. The first energy crisis was an economic disaster and it made clear how much damage even a temporary shortfall in oil supply could do. It provided the political will for America’s first serious effort at energy conservation. In December 1975, Congress passed the Energy Policy and Conservation Act (EPCA). The act empowered the National Highway Traffic Safety Administration (NHTSA) to set standards for the Corporate Average Fuel Economy (CAFE) of cars and trucks sold in the U.S., with the first standards taking effect for the 1978 model year. The purpose of the CAFE rules was to browbeat the domestic manufacturers into building more fuel-efficient vehicles by penalizing them for producing too many gas-guzzlers. The NHTSA set “target minimums” for CAFE and levied substantial fines against any manufacturer whose fleet did not meet the target. Corporate average fuel economy (CAFE) is the harmonic mean (weighted average) of the fuel economy ratings of all the cars or trucks a manufacturer produces. The fuel economy number used is calculated based on laboratory test results (similar to those performed by the EPA to generate the fuel economy estimates you find on the window sticker of a new car). The NHTSA uses a combined fuel economy figure, a weighted average of the city and highway figures. Those combined fuel economy numbers are weighted on the basis of total vehicle production; vehicles that are produced in large numbers count more, while those produced in smaller numbers count less. Since many automakers build at least some of their cars here and others overseas, each passenger-car fleet is divided into separate “domestic” and “import” fleets, each of which is supposed to meet CAFE requirements separately. “Domestic” is defined as a vehicle built with at least 75% U.S. or Canadian content, regardless of badge; a U.S.-market Honda Accord, built in Marysville, Ohio, is considered a domestic car. The distinction between the domestic and import fleets was created as a political concession to the United Autoworkers union (UAW), which was afraid that Detroit would try to meet the CAFE requirements by re-badging cars built overseas in nonunion factories. If a manufacturer’s corporate average fuel economy doesn’t met the target minimum, the company has to pay a civil penalty. The current penalty is $5.50 for each tenth of a mpg the actual average falls below the target, times the manufacturer’s total production. For example, the current target minimum is 27.5 mpg (8.6 L/100 km); if a manufacturer produces 500,000 cars for 2008, with a CAFE of 27.0 mpg (8.7 L/100 km), the manufacturer would be fined ($5.50 x (0.5/0.1) x 500,000) $13,750,000. If a manufacturer’s CAFE exceeds the minimum, the manufacturer earns credits that can be applied to balance out their CAFE for previous or subsequent model years. For example, if the manufacturer who was penalized in the example above raised their CAFE to 28.5 mpg (8.3 L/100 km) the following year, they would earn a credit, which they could potentially apply to offset the penalty from 2008. This is called a “carry back.” Carry backs can only be applied within a three-year period, and only with NHTSA approval; you can’t get out of the fine by saying you’ll apply a credit at some arbitrary point in the distant future. At that time these rules were written, the fuel economy of American cars was at an all-time low. 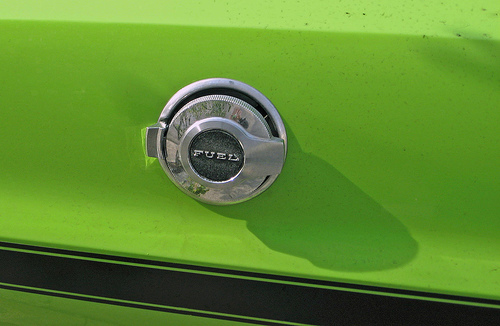 The average fuel economy for the entire domestic industry in 1973 was 12.2 miles per gallon (19.3 L/100 km). Part of the reason for that thirst was the recent advent of pollution controls, which cut into engine efficiency, and of safety standards, which made cars heavier. Even without those handicaps, the American automobile had been growing at an average rate of about an inch a year since the early 1950s. Full-sized cars, which still represented the majority of sales, were over 18 feet (5.5 meters) long and tipped the scales at around 5,000 pounds (2,268 kg). Ford, Chevrolet, and AMC had (somewhat reluctantly) introduced their first subcompact models in 1970 and 1971, but these represented only a small percentage of the market. Most Detroit executives were contemptuous of small cars, which they saw as appealing only to the poor and the lunatic fringe. The oil embargo left the domestic automakers more open than they might otherwise have been to the prospect of higher fuel economy. Sales of big cars had plunged vertiginously during the oil crisis, although they began to recover once the crisis had completely passed. Still, Detroit was not at all keen on the idea of being required to improve their average fuel economy; they already felt unfairly burdened by safety and smog regulations. With everyone’s memories of the grim winter of 1973 still fresh, however, their lobbying efforts found little political traction. The original CAFE legislation called for the target minimums for fuel economy to increase progressively, up to 27.5 mpg (8.6 L/100 km) for the 1985 model year. To meet the targets, domestic automakers had to “downsize” their large and intermediate cars, use smaller-displacement engines, and start paying more serious attention to aerodynamics. The biggest V8s disappeared, and automakers turned increasingly to six-cylinder and four-cylinder engines. The automotive press widely predicted that V8s would vanish completely by 1984, particularly after a second energy crisis in 1979, sparked by the Iranian revolution. Instead, in the 1980s, oil prices began to fall, and the political support for the CAFE targets eroded. (The Carter administration also began deregulating oil prices and removing the windfall tax penalties on oil companies, a process the Reagan administration continued with enthusiasm.) Although the corporate average fuel economy target for 1985 was indeed 27.5 mpg, as stipulated by the original regulations, automakers successfully lobbied to have the target rolled back to 26 mpg (9 L/100 km) for the 1986-1988 model years, 26.5 mpg (8.9 L/100 km) for 1989. The target didn’t return to 27.5 mpg until 1990. Several subsequent attempts to increase it failed, so it has remained frozen at the 1990 level. As improving technology boosted engine efficiency, it became possible to meet that target with larger and more powerful cars. The downsizing trend of the late seventies ended and cars began to get bigger once again. V8 engines, which had supposedly been on the verge of extinction, suddenly became all the rage for luxury cars, prompting even European and Japanese manufacturers to develop V8s, primarily for the American market. What about trucks? The EPCA also gave the NHTSA the authority to set requirements for truck fuel economy, but defined the rules a little differently. A full-sized pickup truck, intended to carry heavy loads, couldn’t reasonably be expected to achieve the same fuel economy as a compact car. Rather than set specific targets for truck mileage as it did for cars, the regulation called for truck fuel economy to be set at the “maximum feasible level,” which the NHTSA determines for each model year. The first target, applied to the 1979 model year, was 17.2 mpg (13.7 L/100 km) for 2WD trucks, 15.8 mpg (14.9 L/100 km) for 4WD. (The separation between 2WD and 4WD was dropped in 1992.) By the late 1990s, it was up to 20.7 mpg (11.4 L/100 km). Until 2008, the truck rules applied only to light-duty trucks, those with a GVWR (gross vehicle weight rating — weight with passengers and cargo) under 8,500 pounds. Really big trucks, like Ford’s late, unlamented Excursion, were exempt. Starting in the 2008 model year, “medium-duty” vans and SUVs with a GVWR of 8,500 to 10,000 pounds are now counted in a manufacturer’s truck CAFE. Open-bed pickup trucks are not, but they will be starting in the 2011 model year. When the truck standards were written in 1975, legislators made two logical but incorrect assumptions: First, they assumed there was an easily definable difference between a passenger car and a truck. Second, they presumed that trucks were primarily working vehicles, purchased by businesses, building contractors, farmers, and other professionals. The idea that people would buy trucks in large numbers as substitutes for passenger cars apparently didn’t occur to anyone. This was a curious lapse considering that car-based utility vehicles (notably, coupe-utilities like the Ford Ranchero or Chevrolet El Camino) had been blurring the lines between car and truck since the 1920s. At the same time, ‘real’ trucks had been growing progressively more civilized and livable. By the mid-1970s, the prospect of owning a truck as an ‘only car’ was far more palatable than it had once been. In the wake of Vietnam and Watergate, also, the cowboy image of trucks became increasingly appealing to a generation of disaffected Baby Boomers. In the late 1970s, the sales of trucks surpassed those of passenger cars and only some of those trucks were being sold to ranchers or businesses. Automakers embraced the truck boom with relish. Since trucks didn’t have to meet the same safety, emissions, or fuel economy requirements as cars, they did not need to be nearly as mechanically sophisticated. The large production volume lowered manufacturing costs, and adding luxury features enabled posh trucks to be sold for premium prices, making them highly profitable. The profit margins became so enticing that other manufacturers got into the game. Automakers began to shortchange their passenger-car development to invest more in trucks. In short, the high percentage of truck sales has reduced the overall fuel economy of the domestic fleet by more than 10%. The corporate average fuel economy requirements have been controversial since they were first introduced and many pundits feel they are a mistake. Automakers hate the rules because they argue that CAFE standards force them to build cars that customers don’t necessarily want to buy and penalize manufacturers for offering the large, powerful vehicles that consumers prefer. Free-market conservatives feel that the market would do a better job of regulating fuel consumption than the NHTSA. They will no doubt point out that this year, thanks to the spike in fuel prices, truck sales are down more than 30%, which will raise 2008’s actual industry CAFE more than any legislation realistically could. Historians will also observe that GM’s move toward downsizing its big cars in the 1970s, which led the industry trend, was in the works before the EPCA passed — it was prompted by the oil embargo, not CAFE. Reducing fuel consumption is important all the time, not just in the midst of a temporary crisis. Buyers may shift toward smaller, more efficient cars during recessions or fuel crises, but history demonstrates that customers and automakers go back to bigger, thirstier vehicles as soon as the economy improves or prices drop. If your goal is to reduce the use of oil, this is problematic. If automakers build more fuel-efficient vehicles only as a reaction to market pressures, they’ll always lag several years behind economic conditions. It typically takes at least three years for manufacturers to tool up for new models even if they involve no new technology or concepts. This is, for example, the dilemma General Motors faces right now; when they planned the 2008 models a few years ago, they bet heavily on big trucks. Now that people are looking for thriftier cars, the best GM can do is make grand promises about what’s coming in 2010-11. The conclusion is obvious: From a fuel-saving standpoint, waiting for cyclical market forces to dictate when it’s appropriate to launch fuel-efficient cars is a losing proposition. Most automakers have little to no inclination to offer small cars or fuel-efficient models without regulatory pressure. Automakers prefer to sell bigger, more powerful, thirstier cars because they’re more profitable. Manufacturers can charge a premium for the extra size and power that far exceeds the additional manufacturing costs. Smaller cars tend to have thinner profit margins and so manufacturers only offer them if they have to. There have been extended periods during which American buyers wouldn’t have been able to buy really frugal cars even if they’d wanted them, simply because no manufacturers offered any. High fuel prices do wonders to motivate buyers to want more fuel-efficient cars, but higher fuel prices aren’t particularly good for the rest of the economy. Sky-high fuel prices raise the costs of every other good, as anyone who’s shopped for groceries in the last six months can attest. Dramatically raising gasoline taxes would move buyers towards more frugal cars, but it would also have considerable economic consequences, especially for low-income people. Incremental improvements in fuel economy are worthwhile, even if they don’t seem significant to individual consumers. Let’s say there was a new technology or aerodynamic improvement that would increase combined fuel economy by 0.2 mpg. No buyer is going to be moved by a bump like that, but applied to all the cars sold in the U.S., it could save more than 30 million gallons of fuel a year. If fuel economy averages were dictated purely by market conditions, automakers would be unlikely to pursue such improvements. The CAFE rules encourage them to do so because even a 0.1 mpg bump can save them millions of dollars. Opponents of CAFE insist that the rules restrict consumer choice and that raising the target minimums above their current levels would force customers to buy cars they don’t want. Without these rules, however, buyers who want more efficient vehicles would frequently be out of luck. Consumers do not design cars; if a buyer needs a car and is interested in fuel efficiency (or low CO2 emissions), his or her choice is to either pick the best of what’s available or wait until the next economic downturn to see if automakers bring out something better. Not much of a choice if you need a car now. The purpose of the CAFE rules is to provide a leveling effect, to push manufacturers to offer fuel-efficient vehicles even when economic conditions are good and fuel prices are relatively low. It also gives automakers a financial incentive to raise the fuel economy of their most popular models — since the better a model sells, the more heavily its fuel economy is weighted for CAFE — and to try to make more-efficient cars that people actually want to buy. In our view, the main problem with CAFE is that by current standards, the rules aren’t particularly stringent. The target fuel economy for passenger cars is still the one set in 1975 and has not been adjusted in 18 years. The standard for trucks — a term that has become so vague as to be useless — remains 22% lower than that of passenger cars. Nor are the penalties for failing to hit the target minimums particularly daunting. A $15 million NHTSA fine is less than manufacturers typically spend on wheel cover designs for a new model; it’s expensive, but not a major deterrent. That means manufacturers, particularly smaller ones, could simply ignore the CAFE requirements and pass the cost of the fines along to their customers. Your author believes that CAFE is a valid tool for encouraging higher fuel efficiency — not a panacea, by any means, but a useful tool. For it to work, however, the bar needs to be raised, the penalties for noncompliance increased, and the loopholes (most particularly the disparity between car and truck standards) reduced. Automakers and their supporters frequently complain that meeting higher CAFE requirements isn’t feasible. It’s important to remember, though, that they’ve been saying the same thing for more than 25 years, during which time the technology to build more fuel-efficient cars (even without resorting to hybrid technology or diesel) has only improved. What is lacking is not the means — only the will. Our principal sources for this article included “CAFE – Fuel Economy,” National Highway Traffic Safety Administration, www.nhtsa.gov/fuel-economy, accessed 22 September 2008, in particular “CAFE Overview – Frequently Asked Questions,” 18 December 2001, www.nhtsa.gov/cars/rules/cafe/overview.htm, accessed 22 September 2008; “EPA’s Fuel Economy and Emissions Program” (EPA420-F-04-053 Fact Sheet), U.S. Environmental Protection Agency, October 2004, www.epa.gov/fueleconomy/420f04053.htm, accessed 21 September 2008; U.S. Congress, Office of Technology Assessment, Improving Automobile Fuel Economy: New Standards, New Approaches, OTA-E-504 (Washington, DC: U.S. Government Printing Office, October 1991); David Halberstam, The Reckoning (New York: William Morrow and Company, 1986); and the Wikipedia® page on Corporate Average Fuel Economy (https://en.wikipedia.org/wiki/Corporate_Average_Fuel_Economy, accessed 22 September 2008). I agree. I think the division that the original Title V rules drew between cars and trucks was a misguided one, and it has led to some really absurd decisions. For example, Chrysler contrived to have its PT Cruiser — which is, by most definitions, a [i]station wagon[/i] — classified as a truck because its combined fuel economy (which I believe is about 23 mpg) balanced out its thirsty Dodge Rams and Durangos. When they introduced the PT convertible, however, they discovered that they had run out of NHTSA loopholes to enable it to be classified as a truck (the logic for calling the regular PT wagon a truck was that its seats could be folded to provide a flat, continuous load floor from the back of the rear seats to the tailgate; the convertible couldn’t do that, because of the interruption of the top mechanism and well). So, the PT convertible is a car, and the wagon is a truck, and it took a good deal of politicking to convince the NHTSA to let them get away with that. If there were a single CAFE standard for all vehicles sold in the U.S. below 8,500 lb GVWR, even if it were the present 27.5 mpg or slightly lower, our automotive landscape would be very different right now. I agree with you that in principle, enforcing fuel economy improvements is necessary and good in the long term. Unfortunately (as you pointed out), it’s had the net effect to push auto-makers towards making (and thus selling) more "trucks". The biggest casualty of this has been the car-based station wagon, which would meet the needs of many a current SUV buyer. Wagons currently hurt automakers under CAFE (as they typically get a few MPG less than the coupe/sedan they’re based on). If CAFE worked properly, it would motivate buyers out of SUVs and into wagons. As I understand it, the most recent revision to CAFE standards passed this year will enforce MPG as a function of "vehicle footprint", literally the area under the car. How much more absurd could it get? This gives automakers every incentive to make cars [i]larger[/i], and fails to take into account things like cargo or seating capacity. Let alone intended use. This is the tragic result of a battle between automakers who’d rather not see any regulation and lawmakers whose automotive world-view consists of Lincoln Towncars, Black Suburbans and "hybrids" (the well-known solution to everything). You seem to be trying to make the case for a different standard to use for classifying vehicles, without actually making one. What do you think would be the best way – or even a better way – to group vehicles into categories for CAFE? I think the ultimate goal should be to make the rules as transparent as possible. I’m thinking that a combination of curb weight (independently verified using sample vehicles with all the usual options, not stripped-down ‘poverty spec’ models) and exterior dimensions would generate useful categories to evaluate all vehicles. Instead of averaging across the entire fleet, it would be easier to pin down either specific models or ranges of cars and harder for manufacturers to bury their gas guzzlers in amongst the sippers. There would be no distinction between ‘truck’ and ‘car’ – only size and weight matter – and the domestics would have to do what their competitors have already done: pass on the additional cost to consumers (a la BMW, MB, Ferrari, etc) or improve their products (Japan, and now, Korea). I think grouping vehicles into categories by size and weight would be a catastrophic mistake. “Burying the gas guzzlers among the sippers” is the point of CAFE; it doesn’t ban thirstier vehicles, but it pushes automakers to offer fuel-efficient products to offset them. If you introduce size/weight categories instead, it will push automakers to concentrate all their products in the largest classes, which is counterproductive. If you can lower your CAFE requirement to 22 mpg (or whatever) by making all your cars 4,000 lb or more, that’s exactly what most automakers will do — and is in a sense what already happened with light trucks. I would favor eliminating the separate category for trucks under 8,500 lb GVW, which would serve to accelerate the trend toward car-based crossovers that’s already in progress, and gradually stepping up the CAFE requirement from 27.5 mpg (to 28 mpg, then 28.5, then 29, etc.). The point I failed to make is that there should be more categories based on vehicle size/weight rather than the overbroad categories in use now. While there is a risk in creating too many categories, doing it this way at least keeps like vehicles with like instead of grouping the apples and oranges in with the watermelon, to abuse a metaphor. I understand what you’re getting at, but I think the categories are a mistake. Basically, if automakers can get away with having a lower average fuel economy if all their cars are over 3,501 lb (or whatever other arbitrary numbers), small cars will abruptly become very scarce, which is essentially the opposite of the desired effect. That’s what already happened with trucks, and if the economy hadn’t tanked, it might have gotten even worse — the bigger Escalade and Navigator already exceed the threshold where EPA fuel economy ratings are required. It strikes me that the most sensible thing would be to class anything sold to non-business users as a passenger car, regardless of whether it’s a Dodge Ram or a Ford Focus, and include it in the manufacturer’s CAFE. That would reduce the incentive to sell soccer moms a Suburban instead of a station wagon, but still leave business customers free to buy a big truck if they need one. I’m sure there’d be a million ways to get around it, but it seems better than trying to regulate by size or weight. The problem with that is that any vehicle (even motorcycles and scooters) can be used for business, and a lot of people claim business use for their vehicles. You don’t have to be a corporation, and a vehicle can be re-purposed for business use at any time after purchase, so the manufacturer has no way of knowing whether the car is being purchased for personal use, business use, or a combination of the two. So, it’s not a very useful means of classification, at least for CAFE. I think if a vehicle can be legally driven with a regular passenger car license, it should be part of the manufacturer’s CAFE. Vehicles over a certain GVWR (usually 8,500 lb) generally require a different, commercial driver’s license — that seems a logical cut-off point. Again, Aaron, this is where I respectfully submit that different weight categories can be helpful by saying that it is the [i]averaging[/i] across overly broad categories that is the problem. I reject – respectfully – that creating narrower categories with different targets and separate penalties/incentives for those categories will make small cars disappear from the market. It will however provide an incentive for manufacturers to market cars differently, and for consumers to make different choices about the cars they drive. In response to David’s comment about commercial vehicles, I’ll point out that there is also a role for states and provinces in helping consumer make different choices through licensing and registration. The states can make distinctions between a pickup truck used as a passenger vehicle and one used in a commercial enterprise by simpling requiring documented proof with every renewal. This all is moot, however, if you don’t believe there is value in regulating fuel economy by influencing consumer choices. The biggest problem with CAFE, I believe, is that it conflates all vehicles as equivalent consumer choices with equivalent environmental and economic consequences. It is in the manufacturers’ interests for their to be no penalty for choosing a larger, thirstier vehicle and little incentive for choosing the thriftier alternative. Either we believe we have a right as a society to regulate these things or we don’t, and if we don’t we should drop all pretense of trying to. I think the current separation of cars and trucks is an example of the kind of categorization you suggest, and I think that separation has been a terrible mistake. The fundamental problem with it is that it presumes consumers view product choices the same way the manufacturer or regulatory agencies do. I would stipulate that consumers generally make decisions based on what available vehicles best meet their needs (tangible and otherwise) for the best price. Those needs [i]may[/i] include ease of parking, fuel economy, or environmental impact, but not necessarily — and the importance American consumers place on fuel economy is directly tied to fuel prices and economic conditions (which are not constants). As a result, there are lots of cases like the big Korean cars of a few years ago, which try to crash the party by offering more metal for the money (a Camry-size car at a high-end Corolla price, etc.) If you create a category system that provides an economic advantage to manufacturers for offering physically larger, heavier cars in a particular price category, they will move away from smaller cars back toward the big, cheap American sedans of three decades ago. I recognize that some people would prefer that, but from the standpoint of reducing fuel consumption, it would be disastrous. And manufacturers [i]will[/i] do that, given such a motivation; if you give people loopholes, they will exploit them ruthlessly. As I said in the article, I do think there is a public interest in regulating fuel economy. I don’t think CAFE is or can be a sole solution, but I think it can have an important role in keeping manufacturers motivated to offer fuel-efficient vehicles even when the economy is good and fuel prices relatively low. The American public’s memory seems to be short when it comes to gas prices and fuel shortages, but reducing fuel consumption is important all the time, not just for a few months every couple of years when there’s a spike in pump prices. In relation with the ‘foreign-built cars’, I remember a story in a belgian car magazine some years ago. Urban myths or not ? Does the CAFE has the same rules for ‘imported’ cars since the beginning ? I’ve heard the rumor about the Crown Victoria/Grand Marquis as well, but I don’t know that it’s true. The NHTSA currently counts Canadian-built vehicles as "domestic" for purposes of CAFE, so having those cars built in Canada wouldn’t make any difference for CAFE purposes. I don’t know exactly when the NHTSA started classifying Canadian-built vehicles as domestic, but it may have been from the beginning (Ford, in particular, has had Canadian plants for decades), but in any case, I believe that the rule preceded the rumor about the Panthers. The domestic/import fleet split is something that goes back nearly to the beginning, if not the very beginning. (For cars, at any rate; it applied to trucks only between 1980 and 1996.) I think it was devised as a concession to the UAW, which was understandably concerned that CAFE would cause manufacturers to turn to ‘captive imports’ like the Mitsubishi-built Plymouth Colt, at the expense of their U.S. factories. The domestic/import split does not exempt manufacturers from the CAFE standard; it must be met separately by each fleet. The point was just to make sure that automakers wouldn’t continue to build gas guzzlers domestically and make up for it by importing all their small cars from Europe or Asia. I disagree with the entire concept of CAFE, as a governmental interference with our lives. Why can’t Americans buy the cars they want to buy? Let the free market work. If they want smaller, lighter vehicles, they will buy them and the manufacturers will build them. If they want larger vehicles they will buy them and the manufacturers will build them. We are in an era where an extremist minority with a certain view (the most important priority is not to drill for energy and leave nature pristine, and Americans need to be forced into a different lifestyle, against their will if necessary, to make that possible) is getting their way through subterfuge and enacting laws that most don’t even realize are in effect. Most of the cars you write about so well could never be introduced now, as we live under the control of anonymous bureaucrats, who will never be satisfied with “good enough”, as that would remove their job security. If oil consumption (and, for that matter, automotive emissions) had no broader consequences beyond the individual owner’s willingness to spend money on fuel, I might agree with you. However, it does, in a variety of ways — it has a profound political and economic impact, even setting aside the environmental ramifications. By the same token, one could say, “Well, there’s no reason the government should be able to say I can’t drive 50 mph on residential streets.” The function of government, in the abstract, is to manage areas where individual rights intersect. The motorist may say he has a compelling right to drive fast on side streets to get to work on time; the local resident may retort that he has a compelling right to be able to pull out of his driveway or walk across his own street without it looking like the straightaway at the Indy 500. The residential speed limit is a compromise — it doesn’t satisfy the motorist’s desire for unlimited right of way, and it doesn’t satisfy a homeowner who would rather not have cars on his street at all, but it allows both to coexist without coming to blows. You can argue that the limit is too high, too low, should have different stipulations, but it serves a purpose. In the same way, CAFE is a compromise. It’s intended to promote the availability and sale of more fuel efficient vehicles without completely restricting consumer choice and without resorting to more drastic measures like very high fuel taxes that would make gasoline cost $8 or $10 a gallon, as it does in the UK and many European countries. It’s a compromise that fully satisfies no one — the people who would prefer to see cars outlawed, or restricted to B-segment hybrid or electric models, aren’t a whole lot happier about it than you are. But, considering the impact high fuel prices have on the prices of everything else, I think it’s a better compromise than many of the alternatives. And let’s get real here: the typical four-cylinder compact is quicker in almost any performance metric than the average V8 family sedan of 40 years ago, and the price of a well-equipped modern family sedan will also buy you a variety of sporty cars with more than 300 real horsepower. The range of choices available to modern automotive consumers is substantially greater than it was in the fifties and sixties. It’s not like we’re living in a world of automotive hair shirts. Today’s car may function better than the older ones, as it should..the cars of the 60s functioned better than those of the 50s, and the ones of the 50s better than those of the 40s…but the government regulations have repressed the originality and style for the most part ever since the era of regulation began in the early 70s. Look at the modern cars in the parking lot…does the Caddy look much different than the Sonata than the Camry than the Malibu? The government regs have complicated them beyond the ability of the average person to understand them or repair them, vastly decreased the amount of choices available to those who don’t have the money for high-priced specialty vehicles, and raised the costs of purchase and ownership dramatically. In the current economic climate, perhaps a simple, low powered, easily repairable modern-day Falcon or Chevy II would sell..but it can’t be produced at a low enough price, due to government regulations. I don’t think that your speeding in the neighborhood simile is valid…many don’t agree that cutting down oil consumption rather than expanding drilling on our territory is the answer to the energy problem, but it would be hard to find many who agreed with a 75 miles per hour residential street speed limit. I don’t see CAFE as a compromise..I see it as a hidden and sneaky way to force Americans into smaller, lower powered, higher-cost vehicles without being brave enough to put that goal plainly in front of the voter. In Europe they did so by adding immense taxes to the gas price…perhaps because Europeans are more used to being told what to do and knuckle under quietly…if American pols tried that here they’d be voted out. I don’t feel that the role of government, at least in America, is to force us into ways of doing things against our will because it feels it is “better” for us. Let the market, ie. the American people, decide. I do really enjoy your site though, and I was thinking today that perhaps the fact that you DON’T revere traditional car culture and values, yet are honest enough to research your subject vehicles truthfully (rather than merely beat on them for not being “green”) is what makes your articles different and more interesting than the average car writing. I look forward to your next article. I do understand the disgruntlement about complexity (and its inevitable consequence, increased costs), although a fair amount of that is driven by merchandising as much as regulation — hence the fact that most new cars have keyless entry and the like. I wince when I see manufacturers like Mercedes and BMW adopting aluminum fenders and hoods to mitigate their expanding girth (as if they weren’t already expensive to fix), I avoid accessories like power seats whenever I can, and I’m still suspicious of power windows, which trade a modicum of convenience for a lot of extra stuff to break. Still, fewer choices? In the under-$30K range that represents the median new car purchase are not only C- and D-segment sedans, but convertibles, convertible hardtops, pony cars, too-cute-for-school fashion statements (smart fortwo, Fiat 500C, Mini Cooper, Nissan Cube), pseudo-SUV crossovers, mini SUVs (Honda CRV, Toyota RAV4), MPVs (Mazda5, the cheaper Kia minivans), hybrids, and, if you hurry before they’re gone, compact pickups like the Ranger. There are some notable omissions — full-size station wagons, big convertibles that don’t cost more than your house, and, in this country, three- and five-door hatchbacks — but those have more to do with limited demand than regulation. I agree that mainstream sedans look and feel an awful lot a like, and at the moment it’s not an aesthetic I’m especially fond of, either. On the other hand, mainstream models have usually looked an awful lot alike. It’s easy to lose sight of that viewing cars in retrospect, because if you see, let’s say, a ’67 Fairlane 500 on the street, it stands out and looks distinctive in a way it didn’t necessarily at the time (period reviews chided it and the comparable B-body Dodge and Plymouth as bland and derivative). If you aren’t a loyalist to a particular brand or don’t keep your Official Car Spotters Badge polished, it becomes hard to tell the mainstream models apart. Even I have that happen with eras I haven’t studied in detail; I have a hard time telling Malaise Era Detroit sedans apart at a glance, and mid-thirties domestics blur together quite a bit. As for oil, new drilling doesn’t alter the fact that it’s a finite resource whose obtainment and use have a variety of mostly undesirable social, political, and economic consequences. Yes, massive fuel taxes is a more direct approach, but that, too, has unappetizing inflationary results — when fuel prices spiked in 2008, I watched uneasily as the prices of food and a lot of other sundries climbed (and recognized that they weren’t going to go down when fuel prices did, as indeed they haven’t). The flip side of the consumer choice argument is the point I’ve made before, which is that in the absence of CAFE, automakers only make an effort to offer relatively fuel-efficient or compact cars in the brief windows after major recessions or oil price spikes. Otherwise, if you wanted something relatively compact and economical that wasn’t a stripped-out fleet special Falcon, you had to get an import — in essence, riding the coattails of home-market regulations that considered American compacts full-size cars. The general weight limit for commercial licenses is 26,000 pounds in the USA. There are various other criteria (e.g. school buses, hauling for hire) which apply in some states. I like the idea of a special license for SUVs and heavier pickups, though. Perhaps aomething like a special license or 55MPH limit for vehicles which are taller than they are wide would do the trick, and address some of the rollover problems when untrained drivers and heavy SUVs are combined. As it sits now, anyone can buy a Ford King Ranch F-450 and tow a four-horse trailer with nothing more than a basic drivers license. Regarding some of the issues relating to petroleum supply, there is a web site named theoildrum.com which is very informative on the topic. Love the site. Love the site. And I just discovered the editorial commentary. It was said by Ann Landers about 40 years ago that some men would rather drive a fast car than make love to a beautiful woman. Your well-reasoned arguments regarding why vehicles should use minimal amounts of fuel are never going to change that mentality. To those there is nothing comparable to “my truck,” “my Vett,” my whatever male-enhancement device. On another note, you might want to consider reading Daniel Yergen’s new book “The Quest” regarding the future of energy production. It’s late to address Matt directly 2 years later but overall it sounds like he has more of a problem w/ government in general than CAFE per se. CAFE only limits his choices indirectly: by making his less fuel-efficient cars be offset by sufficient fuel-efficient cars for the overall manufacturer’s fleet average to meet the standards. End of story. “Let the free market work. If they want smaller, lighter vehicles, they will buy them and the manufacturers will build them. If they want larger vehicles they will buy them and the manufacturers will build them.” Aaron already addressed this. American manufacturers were caught way way short when gas prices rose to their detriment: “when (GM (and Ford)) planned the 2008 models a few years ago, they bet heavily on big trucks. Now that people are looking for thriftier cars, the best GM can do is make grandiose promises about what’s coming in 2010-11.” Dude. This belief in “the free market” is at best overestimated and really incredibly short-sighted and simplistic. I think you just want less taxes, not just less government. Move to Somalia. You’ll get both there. “…vastly decreased the amount of choices available…”. Wrong, wrong, wrong. Period. In the ’60s, for example, Chevy offered the Caprice/Impala/Bel Air (one car), the Malibu/Chevelle (one car), the Nova/Chevy II (one car), the Corvair, and the Corvette. Period. 5 cars. Now? Impala, SS (the Australian Holden-based separate model), Malibu, Cruze, Sonic, Spark, Corvette, Equinox, Traverse…and that’s just off the top of my head! 9 distinct choices without even necessarily being comprehensive. Add incredible numbers of models from other domestic makes and more foreign makes than ever, and, well, you clearly are talking out of your hiney. “to those who don’t have the money for high-priced specialty vehicles, and raised the costs of purchase and ownership dramatically.”. Wow. Yeah, sure, it was just the government regs, buddy. All the other stuff like universal A/C, power EVERYTHING (it’s insane what Mercedes is motorizing/electrifying on the new S-class), leather, leather, leather, sunroofs, AM/FM/CD/Navigation/Bluetooth/USB/iPod jack/etc, heated seats, rear defrost, intermittent wipers, keyless entry, and on, and on, and on – pretty much all of of which comes on a more loaded version of my ’08 Civic (not sure about the heated seats) – may have had a little to do with this, maybe, ya think? “many don’t agree that cutting down oil consumption rather than expanding drilling on our territory is the answer to the energy problem”. They’re short-sighted, ignorant and selfish, those many. I defend to the death their rights to their opinions while I attack their desire to run the show. They show no concern for future generations and the taking away of THEIR choices for the use of finite resources, no concern for the costs of environmental degradation (climate change, oil spills, etc) that we all bear, now and in the future and which frankly are “taxes” in fact, and no concern for logic: really, it makes more sense for us to drill, baby, drill so we can all have phallic ‘vettes and monster trucks? Really? My aforementioned Civic is as large as and roomier than a late ’90s Accord. Frankly, I feel pretty selfish because it’s more than I need! How’s your retirement savings doing with the monthly payments on your $45k Silverado and your McMansion, buddy? You’ll probably be wanting some assistance when you get old because you can’t maintain your lifestyle any more. There, I feel a little better. Thanks for the space, Aaron, and above all, I also thank you, along with Matt, for your clear-headed, thoughtful writing! 1) In 2009, Aston Martin announced that in view of the European Union CAFE regulations due to come into effect in 2012, they would be building a city car. Aston Martin said that initially it would only be available in the UK but that the following year it would become available in Europe too, that AM’s sales target was 4000 a year, and that they already had 400 advanced orders. The Aston Martin Cygnet appeared on the British market in January 2011. The car, as it turned out, was a Toyota iQ (Scion iQ in North America) with an Aston Martin grille slapped on the front, Aston Martin badging, unique Aston Martin wheels, and lots of leather inside. All this good stuff was available for the very reasonable price of £31,000 (about $47,000), which might have been dirt cheap by AM standards but was, nonetheless, three times the price of the Toyota original. Understandably, it wasn’t long (September 2013) before Aston Martin issued another announcement to the press, this time stating that the Cygnet was a dead duck. It would seem that the 400 advanced orders were a mirage (they vanished as soon as buyers saw what they were getting for their money) and that far from selling 4000 a year, total sales over a close to three-year period amounted to 150. You mean you can’t make a silk purse out of a sow’s ear? Who knew? 2) Since 2003 there has been a Congestion Charge in operation in Central London imposed on motor vehicles to discourage the use of private cars and goods vehicles in the city center during weekdays. It started off as being £5 ($7.50) per day and now stands at £11.50 (about $17.50) with fines for non-payment ranging from $100-$300. IBM, of all people, do the actual enforcement and collection dirty work on behalf of the Mayor’s office. There have always been exemptions, of course, such as buses and taxis. The most interesting,though, are plug-in hybrids which qualify as “greener” vehicles. Amongst these are the new BMW i8 and the somewhat older Lexus LS600h. This latter packs a 5-liter V-8 producing nearly 400 hp that does 0-60 mph in six seconds dead, has a speed-limited maximum of 155 mph, and on top of that, it even parks itself. Now that’s what I call environmentally friendly! At about $150,000 it isn’t exactly a bargain but for those forced to use their car daily in the Congestion Charge Zone, it represents a way to save $4,500 a year in congestion charges. 3) Over the years, the aim of the Congestion Zone has mutated from being one of reducing congestion to that of reducing pollution but, much to the chagrin of the greens and the anti-car lobby, it doesn’t seem to have been particularly successful at doing either. In 2012, it was announced that after 10 years since its introduction there had been a total reduction of 10% in traffic volume and an 11% reduction in the number of vehicle journeys yet, at the same time, average journey times were now slower than before the zone was introduced thanks to road-narrowing, the introduction of cycle lanes, and other measures undertaken in the meantime by City Hall to drive car users off the road. Furthermore, the most congested AND polluted stretch of asphalt in London (and indeed in the whole of Europe according to the EU) is Oxford Street which is closed to private traffic and is used almost exclusively by buses and taxis. I remember reading about the Cygnet, although I certainly never saw one except in magazine pictures. Even the iQ is quite rare — I think I’ve seen one in the wild. I only found out about the Cygnet because I was waiting at a bus stop one evening in the summer of 2011 for a lady I’d arranged to meet for a date. She was running late (as ladies tend to do) and as I waited, a small white car parked on the sidewalk behind where I was standing caught my attention and aroused my curiosity because I’d never seen that particular model before. It was only when I took a close look and noticed the Aston Martin badging that I discovered what it was. Had it not been for that chance encounter, I would never have even known it existed. Perhaps it was the grille that initially aroused my curiosity. Had it been today, I probably would never have noticed given that the current Ford Fiesta, Focus, Mondeo (Fusion in N. America) and much of the rest of the Ford range all have that same grille. Ford used to own Aston Martin, along with Jaguar and Volvo (and Land Rover at one point,) and stylist Ian Callum has been involved to a greater or lesser extent with all those brands. He was credited with much of the design work on the DB7 and with the DB9 as a whole, has been director of design at Jaguar since 1999 (they are entirely his since 2006,) and has contributed to Volvo and Mazda styling too. He also did work for Ghia (another Ford subsidiary) together with his younger brother Moray. Although Ian hasn’t worked directly for Ford since 1990 (though he was credited with the design of the Ford Puma of 1997-2001 and probably contributed to the contemporary and very similarly styled Ford/Mercury Cougar of 1998-2002), Moray was “imported” from Ghia to Dearborn in 1995. In 2001 he was despatched to Japan and made head of Mazda styling before being brought back to Dearborn in 2006 to head up Ford passenger car styling for North America where he remains today. That there should be a family resemblance, at least in the grille department, between Aston Martin and Ford passenger cars (despite Ford having sold AML in 2007) should come as no surprise, therefore, if the family being referred to is not the Ford family but the Callum family. Back in the early ’90s, i.e., when Ford had just bought the company, older brother Ian set the styling direction which Aston Martin adhere to to this day and the current crop of Fords are the first that were totally designed under the direction of younger brother Moray. Coincidental resemblance? I think not. It is time to do an update on the CAFE article. The standards were substantially upgraded by Obama but Trump has proposed weakening them again. California and some environmental groups have objected. I was unable to find out the current status of the Trump proposal (the NHTSA and EPA web sites are terrible). We had some communications a few years ago, but somehow I became distracted. Good to see that you’re still up. Are you doing anything on self driving cars? Good to hear from you. As soon as I saw the article title in the comments queue, I thought, “Man, I need to update that article because its definitions are outdated,” so I definitely agree! The Obama-era standards should be feasible enough, since the statutes and regulatory text are still around (the latter in the Federal Register). Proposals are always tricky to track even in an administration committed to normal standards of transparency and public disclosure, which, well. Could I contact you to follow up? You might have some ideas regarding informational resources that haven’t occurred to me.